Aloha and welcome to Arianna Farms 'Ono Kona Coffee, home of Coffees by Arianna™. You will find our Arianna™ Peaberry below. Coming soon -- Sweet Arianna™, Old Hawaiian Arianna™, Special Arianna™, and Estate Arianna™! We invite you to browse through our store and shop with confidence. 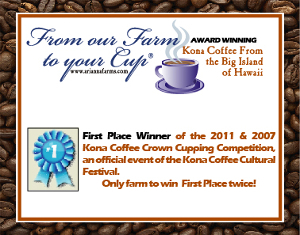 THANK YOU FOR VISITING Arianna™ and Arianna Farms 'Ono Kona Coffee® ! HAVE AN ARIANNA™ KIND OF DAY! For all Roasted Coffee Beans. We reserve the rarest of coffee beans, the Arianna™ Peaberry, for our direct customers... this will be found no where else! YOUR ARIANNA™ COFFEE WILL NOT BE ROASTED UNTIL YOU ORDER, SO IT'S THE FRESHEST IT CAN BE!